The pregame show from Fort Leonard Wood starts at 6:30 p.m. CT. The game starts at 7:15 p.m. in St. Louis. 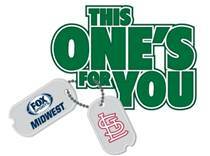 Details: FOX Sports Midwest will broadcast live from Fort Leonard Wood before, during and after the Cardinals game on Friday, May 29 as part of the network’s annual This One’s For You telecast to troops. The Cardinals Live pregame and postgame shows will originate from Fort Leonard Wood, with the historic Nutter Field House as a backdrop and U.S. Army Soldiers, Marines, Sailors and Airmen in the audience. Pat Parris and Al Hrabosky will host the show. FOX Sports Midwest will feature live interaction with service members at Fort Leonard Wood during the telecast of the Cardinals’ game against the Dodgers that night. “I have served all over the world as an Army Bandsman for the past 13 years, and Cardinal baseball has always been the one thing that has kept me close to home all of these years,” said Sgt. 1st Class Tim Kresse from Decatur, Ill., who is assigned with the 399th Army Band at Fort Leonard Wood. In addition to being televised on FOX Sports Midwest, the game will be shown on American Forces Network to troops throughout the world. This is FOX Sports Midwest’s 11th year producing a This One’s For You telecast (the first came in 2005). It’s presented in coordination with FOX Sports Supports, a nationwide effort which supports our military. It is made possible through the assistance of the Cardinals, Fort Leonard Wood and American Forces Network. Previous Post: A Tale Of Two Players.